Подано принципи використання інформаційних технологій для прогнозування та діагностики бойової психологічної травматизації військовослужбовців. Наведено опис структури, методи використання та алгоритм роботи програмного комплексу «Бойова психологічна травматизація особистості», який був створений співробітниками науково-дослідного центру Національної академії Національної гвардії України. кандидат психологічних наук, старший науковий співробітник. Kolesnichenko O. S., Gorelyshev S. A. and Poberezhnyi A. A., 2014. Psychodiagnostic complex for definition of level of psychological readiness of the military to actions in extreme conditions [Psykhodiahnostychnyi kompleks dlia vyznachennia rivnia psykholohichnoi hotovnosti viiskovosluzhbovtsiv do dii v ekstremalnykh umovakh]. 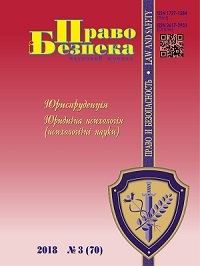 Zbìrnik naukovih pracʹ Harkìvsʹkogo unìversitetu povìtrânih sil – Scientific Works of Kharkiv National Air Force University, Vol. 40, Iss. 3, pp. 171-174. Agrell Ya., 1970. Stress: its military consequences – psychological aspects of the problem [Stress: ego voennye sledstniya – psikhologicheskie aspekty problemy]. In: Levi L. (ed.). Emotional stress. Physiological and psychological reactions. Medical, industrial and soldiery consequences of stress [Emotsionalnyi stress. Fiziologicheskie i psikhologicheskie reaktsii. Meditsinskie, industrial`nye i voennye posledstviya stressa]. Stockholm, February 5-6, 1965. Leningrad: Meditsina. Pp. 248-255. Vorobyova I.V., 2012. Automated psychodiagnostic complex for determining the professional suitability of candidates for military service in the internal troops of the Ministry of Internal Affairs of Ukraine and training in higher military educational institutions of the Ministry of Internal Affairs of Ukraine [Avtomatyzovanyi psykhodiahnostychnyi kompleks vyznachennia profesiinoi prydatnosti kandydativ na viiskovu sluzhbu u vnutrishni viiska MVS Ukrainy i navchannia u vyshchykh viiskovykh navchalnykh zakladakh MVS Ukrainy]. Kharkiv: Akademiia Vnutrishnikh viisk MVS Ukrainy. Vorobyova I.V., Gorelyshev S.A., Matsehora Ya.V. and Poberezhnyi A.A., 2015. Information technologies in solving the problems of psychological research, 2015. Information technology in solving problems of psychological research [Informatsionnye tekhnologii v reshenii zadach psikhologicheskikh issledovanii]. In: Social psychology of health and modern information technologies [Sotsialnaya psikhologiya zdorov`ya i sovremennye informatsionnye tekhnologii]. Part 1. Brest, April 14-15, 2015. Brest: Brestskii gosudarstvennyi universitet imeni A. S. Pushkina. Pp. 112-124. (Ed. : Medvedskaya E.I.). Prykhodko I.I., Vorobyova I.V., Timchenko O.V. et al., 2010. Development of an automated psychodiagnostic complex for determining the professional suitability of internal troops, candidates for military service under a contract, for training in higher and secondary military educational institutions of internal troops of the Ministry of Internal Affairs of Ukraine [Rozrobka avtomatyzovanoho psykhodiahnostychnoho kompleksu vyznachennia profesiinoi prydatnosti viiskovosluzhbovtsiv vnutrishnikh viisk, kandydativ na viiskovu sluzhbu za kontraktom, na navchannia u vyshchi ta seredni viiskovi navchalni zaklady vnutrishnikh viisk MVS Ukrainy]. Kharkiv: Natsionalna akademiia Natsionalnoi hvardii Ukrainy. Prykhodko I.I., Matsehora Ya.V., Vorobyova I.V. et al., 2013. Development of the system of psychological safety of servicemen of internal troops of the Ministry of Internal Affairs of Ukraine Development of the system of psychological safety of servicemen of internal troops of the Ministry of Internal Affairs of Ukraine [Rozroblennia systemy psykholohichnoi bezpeky viiskovosluzhbovtsiv vnutrishnikh viisk MVS Ukrainy]. Kharkiv: Natsionalna akademiia Natsionalnoi hvardii Ukrainy. Kolesnichenko O.S., Timchenko O.V., Parkhomenko O.O. et al., 2014. Psychological readiness for the professional activity of servicemen of internal troops of the Ministry of Internal Affairs of Ukraine in the performance of service and military missions on duty [Psykholohichna hotovnist do profesiinoi diialnosti viiskovosluzhbovtsiv vnutrishnikh viisk MVS Ukrainy]. Kharkiv: Natsionalna akademiia Natsionalnoi hvardii Ukrainy. Kolesnichenko O.S., Yurieva N.V., Timchenko O.V. et al., 2016. Psychological preparedness for the soldiers of the National Guard of Ukraine [Psykholohichna hotovnist do ryzyku viiskovosluzhbovtsiv Natsionalnoi hvardii Ukrainy]. Kharkiv: Natsionalna akademiia Natsionalnoi hvardii Ukrainy. Kolesnichenko, O. і Gorelyshev, S. (2018) Використання інформаційних технологій для прогнозування та діагностики психологічної травматизації військовослужбовців – учасників бойових дій, Право і безпека, 70(3), pp 57-63. doi: 10.32631/pb.2018.3.08.